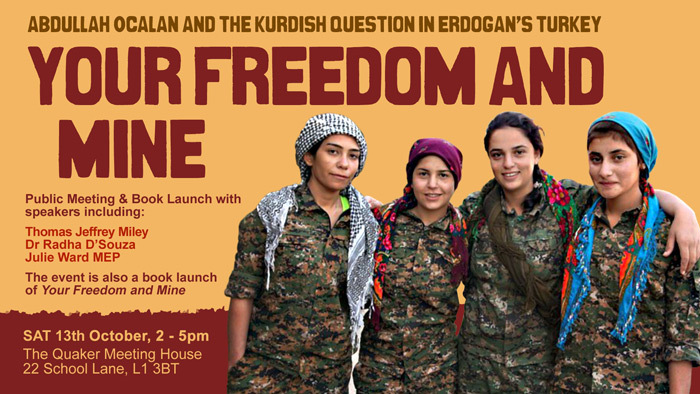 At the Quaker Meeting House in Liverpool on 13th October there will be an inclusive discussion about the Kurdish Question in Erdogan’s Turkey. When the states of the Middle East were constructed in the years after World War I, the Kurds – a people consisting of some 30-40 million individuals – were left out. Treated as unwanted appendages of those states in their ceaseless drive for homogeneity, Kurds have been the targets of genocide, torture, and attempts to annihilate their language and culture. Poverty and deliberate underdevelopment have featured prominently in states’ assaults against them. Most recently, Turkish president Erdogan’s atrocities and crimes in the predominantly Kurdish regions have left some towns resembling “empty moonscapes and vast parking lots”, according to UN reports. Leading politicians pursuing a peaceful solution to the Kurdish Question have been thrown in jail on trumped-up charges. The Kurds have learned to resist in the face of this striking oppression. The theory of Democratic Confederalism, originally proposed by the imprisoned Abdullah Öcalan, demands a radically democratic solution – not just for the Kurds but for the entire region and all of its peoples. It is a project that demands the long-overdue emancipation and empowerment of women, a democratic economy based on shared ownership and control of the means of production, self-determination for all cultural groups, and an absolutely vital emphasis on ecology. As humanity stands on the edge of a precipice the likes of which it has never seen before, it is incumbent upon all of us to pay attention to projects like this and to learn from them. This is a book-launch event for “Your Freedom and Mine: Abdullah Öcalan and the Kurdish Question in Turkey”, edited by Thomas Jeffrey Miley and Federico Venturini. Copies of the book will be available to purchase on the day. There will also be a spoken-word performance in honour of Abdullah Öcalan by revolutionary Chicano poet Matt Sedillo, all the way from Los Angeles. Matt Sedillo writes from the vantage point of a second generation Chicano born in an era of diminishing opportunities and a crumbling economy. His writing – a fearless, challenging and at times even confrontational blend of humor, history and political theory – is a reflection of those realities. The poetry of Matt Sedillo is in turn a shot in the arm of pure revolutionary adrenaline and a sobering call for the fundamental restructuring of society in the interest of people not profits. Dr Thomas Jeffrey Miley – Lecturer in Political Sociology at the University of Cambridge and member of the EUTCC international peace delegation. Dr Radha D’Souza – Lecturer in Third World Approaches to International Law at the University of Westminster and member of the EUTCC international peace delegation. Julie Ward MEP – Labour Co-op MEP for Northwest England and member of the EUTCC international peace delegation. Matt Sedillo – Revolutionary Chicano poet from Los Angeles.